Michell Instruments has developed a customised solution to measure relative humidity and temperature in the paint spraying facility for a major European car manufacturer. This enabled them to upgrade the humidity and temperature control on their existing ventilation system. Cars are sprayed with several different coats to protect from corrosion, seal and prime as well as a coloured base coat and clear finish-coat. The whole process may take up to 12 hours to complete and during this time the relative humidity in the facility must be kept stable at 60% RH to ensure a tough and flawless finish. A consistent temperature is also needed for the paint to dry completely between each stage. 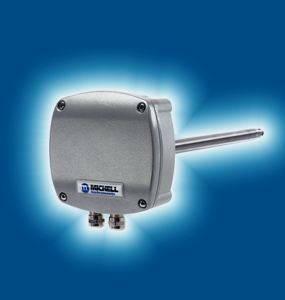 Michell’s DT282 Duct Mount relative humidity and temperature transmitter was selected for the upgrade because it uses the I7000 Hygrosmart sensing module. The sensor is accurate to ±2%RH and to ±0.2°C and is highly stable with less than 1% RH drift over a year to maintain the ideal conditions within the painting facility. Because of the high level of fumes from the painting, the I7000’s high chemical resistance means that it works reliably for long periods, where other, less resistant sensors would need replacing. When maintenance is needed, the I7000 interchangeable ‘plug and play’ system makes it easy. This is important for production processes, such as paint spraying, as stoppages affect the whole production line. The customer was worried that an older product, which had been upgraded, would no longer fit the ventilation system. Michell’s engineers worked quickly to adapt the standard product so that it would work in the system. The result was that the customer was able, at minimum capital outlay and disruption to their plant, to replace and upgrade their climate-control system. Michell’s customisation projects help to future-proof processes and systems by ensuring that, while products may be improved and upgraded, this will not prevent the new versions from being compatible with existing plant equipment.